Two more terrific poets will offer workshops to benefit the Sue Boynton Poetry Contest on Saturday, November 14, 2015. Workshops are held on the lower level of the Fairhaven Library in Bellingham, Washington. Registration is required: $30 for one workshop or $50 for both workshops offered the same day, paid by check or cash at the workshop. Register by sending an email to boyntonpoetrycontest@hotmail.com indicating the workshop(s) you wish to take and including your name and a phone number. Please bring writing materials. Linebreaks help you construct a poem, especially as you draft the poem’s final form. In this workshop, participants will respond to writing prompts to create stanzas, and then practice the art of line breaks. The class will consider how other poets used this integral craft by studying poems to discern poets’ diverse decisions about linebreaks. Linebreaks can define the poem, create cadence, establish emphasis, aid the reader in decoding meaning, uncover rhyme and half-rhyme, fudge clunky moments, provide humor, enhance sound, alter pace, and clarify phrasing. Some poets use linebreaks, spacing, and tabbing to display the process of the poet writing at the moment of creating a poem — its intellectual or emotional structure. Ann Spiers is the inaugural Poet Laureate of Vashon Island. She stewards the Poetry Post in Vashon’s Village Green, co-produced the 2009 Vashon Poetry Fest, and curated Broadsides: Poems on Paper at a Vashon art gallery. Bellingham’s poets have been good to Ann. Egress Studio Press published her chapbook, What Rain Does. She has read at the Whatcom Poetry Series and Village Books. She fondly remembers reading T. S. Eliot’s “The Hollow Men” at Fast Eddie’s Tavern when the audience raucously joined in the poem’s refrain. This year, Peasandcues Press designed and printed the broadside, “Rain Violent,” a poem from her Weather Station manuscript. Michael Daley was born and raised in Dorchester, Massachusetts. He later took vows and prepared to become a Catholic priest. Upon leaving religious life, he was wild in the streets, protesting wars and seeking a life of experience. He holds a B.A. from the University of Massachusetts and an M.F.A. from the University of Washington. He is the founding editor of Empty Bowl Press, former Poet-in-Residence for the Washington State Arts Commission, the Skagit River Poetry Foundation and the Massachusetts Cultural Council, and a retired English Instructor for Mount Vernon High School. In addition to seven chapbooks, he has published three full-length collections of his poetry and a book of essays. He has been awarded by the Washington State Arts Commission, Seattle Arts Commission, Artist Trust, Fulbright, and the National Endowment of the Humanities. Opening: Friday, October 30; 7-9 p.m. Opening: Thursday, October 29; 6-8 p.m.
More Meg Hitchock on her artist’s website. On a geographically related note…if you’re headed to the East Coast, you might also consider attending the 42nd Annual New Year’s Day Marathon Benefit Reading for The Poetry Project at St. Mark’s Church. Renée Sarojini Saklikar’s award winning book of poetry, children of air india, un/authorized exhibits and interjections (Nightwood Editions, 2013), is a beautiful and chilling exploration of the wrenching emotion and long institutional silence surrounding the June 23, 1985, bombing of Air India Flight 182 off the coast of Ireland in which 329 lives were lost. Inspired by Saklikar’s book and his own research, Irish composer Jürgen Simpson has created air india [redacted], which will be performed in Vancouver by the Turning Point Ensemble with soprano Zorana Sadiq, countertenor Daniel Cabena and baritone Alexander Dobson. There will be five performances, November 6, 7, 8 (matinee), 10 and 11, 2015, at the Fei and Milton Wong Experimental Theatre, Goldcorp Centre for the Arts in Vancouver, BC. For additional information, see the event page on Simon Fraser University’s website. 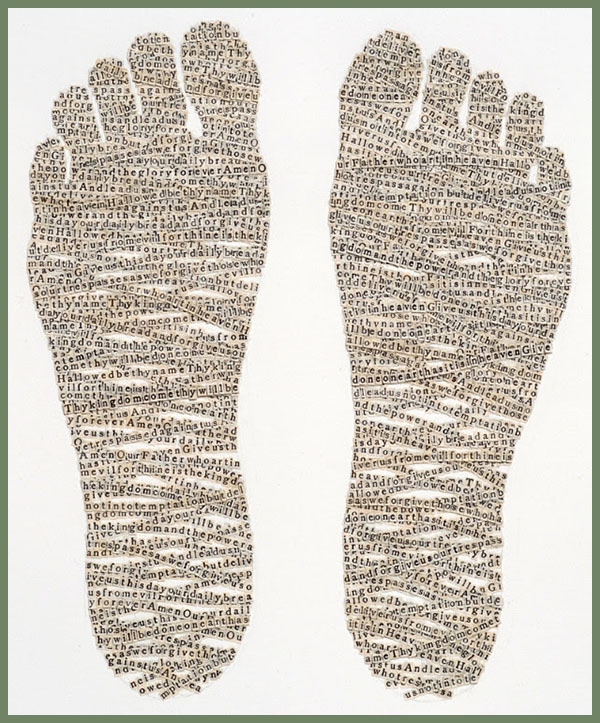 For further details on Renée Sarojini Saklikar and her chronicle of place, identity and language, see thecanadaproject. 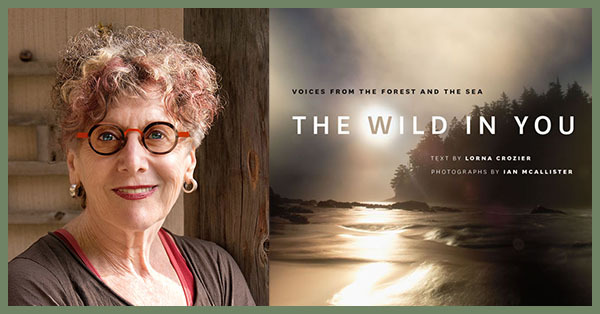 This should be a treat: Canadian poet Lorna Crozier will read from her latest book, The Wild in You: Voices from the Forest and the Sea, tomorrow, Wednesday, October 28, 2015, at 7:00pm, in the Readings Gallery at Village Books, Bellingham, Washington. A collaboration between Crozier and photographer Ian McAllister, the book combines exquisite words and images of wilderness. In connection with the inspiring Whatcom Museum exhibit, Unhinged, book artist Elsi Vassdal Ellis will offer a workshop, Soft Cover Hand-Bound Bookmaking, on Saturday, November 7, 2015, 10:00am – 4:00pm, in the Lightcatcher Studio (Bellingham, WA). Participants will learn an easy, aesthetically pleasing technique to create a journal or sketchbook, constructing a simple wraparound soft cover, reinforcing the spine with decorative paper, and sewing the sections directly to the cover with a simple pamphlet stitch. Elsi Vassdal Ellis has been making books since 1983. Her work is included in many public collections, including the San Francisco Museum of Modern Art, National Museum of Women in the Arts, and the Brooklyn Museum. She teaches digital pre-press, offset and letterpress printing, graphic design history, materials and finishing, and book arts at Western Washington University. The workshop, $70 General/$65 Museum members (includes some supplies), is suitable for ages 15+. Class size is limited and registration is required. Registration deadline is Monday, November 2. Register by phone at 360-778-7000 or in person at the Bellingham Parks and Recreation office, 3424 Meridian Street. Supply list available at registration. Bring your lunch. 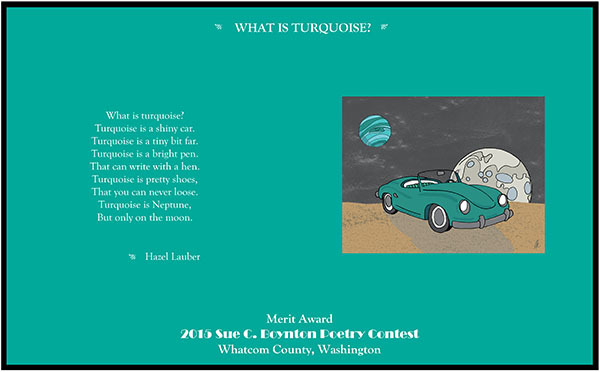 Turquoise is a shiny car. Turquoise is a tiny bit far. Turquoise is a bright pen. That can write with a hen. That you can never loose. But only on the moon. *Copyright 2015 by Hazel Lauber. Broadside illustrated by Megan Carroll.